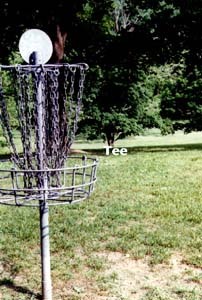 Hole #9.....When I designed this hole, the 2 large maples that stand right in front of the tee were not this large. There used to be a nice opening between the trees that you could throw through.....You notice that I said "used to be". The 2 large maples now provide a large wall that only tree surgeons can throw through. 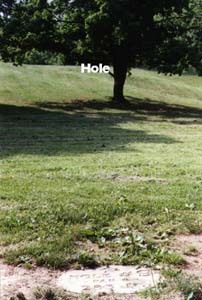 The Pole Hole lies about 30 feet above the tee with another maple protecting the right side of the fairway near the hole. A large drainage area runs perpendicular to the fairway and about 8 feet behind the Pole Hole. This drainage area is about 20 feet deep, so you don't want to go long. This is a tough hole, but once you learn its little secrets, it will usually let you par the hole.